I’m on the two-day cusp of departing from Taipei for the beautiful work that awaits in Seattle, and am thus taking my annual last-week-of-July blogging vacation. I would, in the meantime, like to recommend several fascinating sources for your delectation, enjoyment, and edification. * C-Span’s panel discussions on the origins of the Korean War (particularly the remarks by the guest from London, and the percussive readings at 43:30, followed by discussion of tattoos in POW camps) and Truman’s postwar Japan policy, both of which have something broadly to do with the topic tackled in my dissertation “Chinese Nationalism in the Shadow of Japan, 1945-1950,” a revised version of which has been the object of my present academic “protracted warfare” campaign here in Taiwan. * Following up on previous discussion on this blog about testimony about North Korea by the old hand Selig Harrison to the U.S. House Committee on International Affairs in June 2009. We were waiting on the transcripts to arrive, and now they have. 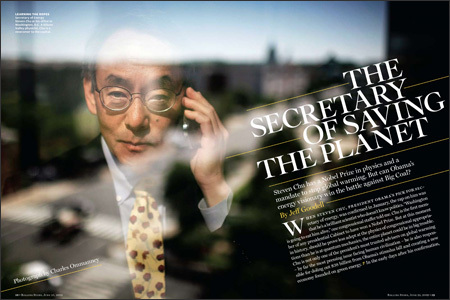 * Discussion of the role played by Energy Secretary Steven Chu in the BP oil disaster management. I may as well tell you right now that I believe that Steven Chu should be the next President of the United States. Yes, that’s right, America! You need to get on the Steven Chu bus for 2016! I’m quite sure he doesn’t want the job and would rather return to doing scientific research with international collaborators, and possibly working up his latent Chinese fluency, which is precisely why he deserves to be President. Imagine a President who can talk smack to the CCP in the putonghua about the number of coal particles per cubic meter of air in Shaanxi! * Speaking of people in new jobs, basketball fans and observers of my old hometown of Cleveland, Ohio, will enjoy this forward-looking discussion about coach Byron Scott’s plans for progress in the post-LeBron James era. This blog has discussed LeBron James’ previous campaigns in Shenyang, Liaoning province; an interesting look by a sports writer describes how the city of Beijing was central to recent axis-turning moves in the National Basketball Association. It also goes without saying that I very much want to meet this person and am determined to play some of his music in the next three-year period. However, apart from the tremendous work by the soloist/composer, the orchestra is young and its string sound is really rather anemic, with the exception of the guest concertmaster, E. Marc Thayer of the St. Louis Symphony Orchestra. I was fortunate to have dinner with Marc in St. Louis a few weeks after his return from Iraq, and learned a great deal from him about the nuts and bolts of musical diplomacy in Kurdistan. He is continuing cooperation with two violin students he met there. Why do I care about musical exchanges with Iraq? Because people interested in cultural diplomacy with China are connected, and because I’m interested in this as a possible future model for musical diplomacy with a more open DPRK (or integrated northern Korea). I do think that it’s important that, in the event of a German-style reunification/absorption/annihilation of) North Korea, that the old DPRK’s musical culture is not completely jettisoned. And contrary to what Christopher Hitchens rather drunkenly asserts (among a host of other errors) in his otherwise interesting “Axis of Evil” speech, not everything in the DPRK is about the Kim family, particularly when it comes to musical training and performance. I don’t mind admitting that I’ve read more than a few sentences about education and music in Kim Il Song’s Works with which I can wholly agree. (At this point I might remind readers of the potential for anti-Chinese sentiment in the Works and assert that any successor to Kim Jong Il had better be damned adroit in reinterpreting the 88 volumes of those Works in order to justify new reforms, but then again that would be gratuitous). * More discussion of the Dalian oil spill in China, along with a review of Chinese-language news stories focusing on US-ROK naval exercises and Sino-German relations, is available on my Twitter feed. I should be back on or around August 1, hopefully with some news about new publications and/or submitted manuscripts, since some people, after all, are keeping track of their scholarly statistics. Ste-ven CHU! Ste-ven CHU! STEVEN CHU in 2016...You heard it here first. Hell, the man might even have some new ideas for how to save the city of DETROIT. See you in ten days. Nice picture of Chu overlooking Beijing. Best view in the city.